Do you have questions about where to go for assistance with health and human service programs? Did you just move and need to change the address on your driver's license? Or maybe you need to enroll your children in school. 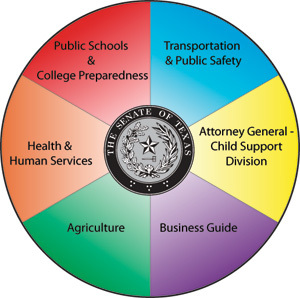 I am here to help you with all of your questions regarding services Texas offers to families, individuals, and businesses. If you do not find the agency or resource you are looking for, call my office toll-free at 1 (866) 259-5016. For referrals to the appropriate Texas Health & Human Services agency, you may dial 2-1-1, or call the main line toll-free at 1-877-541-7905. • Where and how do I register my child for school if our family just moved? Contact the school district for your area and find out for which school your new home is zoned. • Where can I find a map that shows district and school boundaries? Each school district has this information available on their website. School district websites can be accessed through the links listed above for Region's One and Two. • How do you enroll in a charter school? What are the costs associated? Charter Schools are open enrollment public schools in the state of Texas and are tuition free. • When does the school year start in Texas? School districts determine the academic calendars individually. Each school district has this information available on their website. • How do I apply for financial aid? What schools should I apply to, or are they all pretty much the same? Applying to college is one of the best decisions you can make. While the application process can be challenging, it can also be a lot of fun as you plan a course of study that will shape the rest of your life. Your first step in applying for school? Complete the standard applications for financial aid, the FAFSA for federal aid or TAFSA for state aid. Check with your school counselor or visit the website listed below for additional resources. Choosing the school that's right for you requires a lot of personal reflection and conversation with your family. Not all schools are the same, and not everyone's academic goals are similar. Some students want professional degrees (medicine, law, accounting) while others want to pursue academic degrees for a future in teaching or research. Whatever you want to accomplish, do your homework and look into each school that interests you. The site College for All Texans is a great resource for prospective college students and is available in both English and Spanish. Traveling? Planning a vacation? Or maybe you just need to know if the construction project on your way to work or school is complete. In any event, check this link for available updates. South Texas is home to a variety of agricultural industries. Farming operations require constant access to the latest information on crop management and safety. Some business owners grow great fruits and vegetable but need a little help on the business side of things. AgriLife Extension, a organization housed at Texas A&M University, offers a variety of resources to Texas' agricultural community. From science to business sense, the AgriLife Extensions hosts classes and provides instructional material to help our thriving farming communities. Check out the AgriLife Extension to read about the different types of educational support services offered. Small businesses are the heart and soul of Texas' economy, creating jobs, innovating new services and products, and generating a broad tax base that keeps Texas taxes low. Texas remains an increasingly attractive state for private investment. 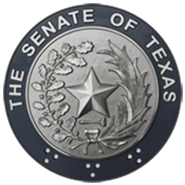 For businesses in Senate District 20, the Texas Comptroller of Public Accounts of Texas a maintains a variety of links for start-ups and existing businesses. Whatever your question, the Comptroller's office can assist you with filings (organizational and tax) and create a schedule to make sure you comply with state requirements. Go to the Texas Business Center, and find what you need to keep your business operation current on all filings. If you have any additional questions, you can also contact my office and my staff will gladly help you with your questions. Curious about the economic climate in Texas? The Comptroller's office also conducts research on a wide range of topics related to the state's financial outlook. From business activity to assessments of federal policy impacts on Texas' economy, this link is the first look at all of the subjects covered by the Comptroller's office: Texas Finances. The Attorney General's office can help you enforce a child support order. The Child Support Division puts Texans with child support orders in direct contact with a case specialist. Case specialists can locate a parent and set up a payment arrangement for arrears and on-going child support payments. For Acknowledgment of Paternity questions, please call 1 (866) 255-2006.